I often get asked about the gear we use – which cameras, lenses and lights, which dry suits we dive in, which underwater housing is the best, should you use a GoPro for diving. 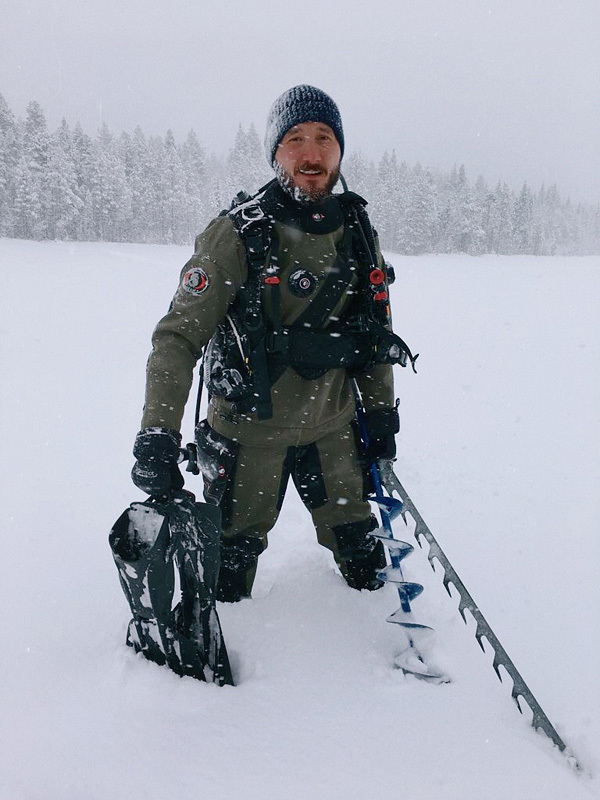 In my years of work I have tried lots and lots of different equipment and I only use gear which is comfortable and easy to use for me, and which will stay functional during the whole course of my expeditions to the edge of the world. I have compiled a short list of my favourite equipment and will be very happy if my recommendations will help you create your own robust setup for underwater photography, or get a good drysuit or regulator. Choosing a camera is like choosing a religion. I started with a simple Canon 400D, then transitioned to a Canon 5D Mark II, then I changed over to Nikon and was much much happier. Right now my main workhorse camera during my dives is the Nikon D810 and it is simply fantastic. I am actually very particular about my equipment and am constantly looking for that perfect piece of gear, however, everything about this camera is great. The Nikon D850 will be my next camera for sure. As for lenses, I am a lifelong Zeiss fan. I use an old Zeiss 21mm f/2.8 Distagon and the new Zeiss Milvus 50mm f/2 Macro and plan on getting three-four more lenses for taking images on land. These are expensive, heavy lenses with no autofocus, but the quality of the images, the detail, colour, and micro-contrast is simply amazing. Just try them for yourself and you will never be able to look at other lenses. For videography, my team and I use a Panasonic GH4 and GH5 with a whole bunch of objectives. These are amazing cameras, especially for with their size and price, which can generate great 4-K video which is sufficient even for high-budget documentaries. The internal stabilization and 60 frames per second of the inexpensive and compact GH5 are actually the future that is already here. I sincerely recommend you check out this camera if you plan on working with video. On land, you have a far wider choice of what to use. I’ve had a Leica X1, Fujifilm X-Pro1, and X-E2, Nikon D750, D800, and D810, as well as a medium-format beast - the Hasselblad H6D-50c. Practically all the modern cameras, both bulky DSLRs, and compact mirrorless cameras are now achieving images of qualities unimaginable to even the top-level professional cameras of several years ago. If you plan on being a Pro photographer, my advice is to invest in the best optics you can afford (yes, I mean Zeiss) and choose a camera suited to your tastes. In order to take images underwater, you need reliable underwater housing and lights. For the last 10 years, I have been diving with housings made by the Austrian company Subal. Their housings are a suit of the finest, waterproof armour, machined out of a solid block of aluminium, and allow complete control of the camera inside. Ergonomics and easy control are very important in the icy waters of the Arctic seas since all of the work is done in thick gloves. Subal are the greatest housings I have ever tested for these conditions. And you can also use them to break the ice) After switching camera system, I have also gone through several models of their housings and am currently ordering another batch for the whole team. I highly recommend them. Oh, and most importantly – never buy these transparent plastic housings. Even though they do have one advantage – you always can see the water inside! For lighting, for some years now I have been using Z-240 strobes by Inon. Despite their modest size and weight, they have enough power for almost any scene. During the 10 years I have used them, 2 strobes out of 5 broke at some point, but in general, the quality and ease of use are great. For video, we use Russian-made AMG lights which provide 5400, 7000 and 12000 lumens. They are simple and reliable because they do not have anything that can break. We also use them during especially dark dives. RAW processing, editing, colour correction, sorting and storage of files – these things are no less important than the dives, and a good set of hardware on the work table is also essential. My main system is a “Black Bucket” MacPro with maximum RAM and an EIZO CG277 monitor. And if the computer is just a carrier of my favourite OS X system, then a good display is a critical tool for any photographer or film-maker. Professional EIZO monitors are absolutely unrivalled. I have tried a whole bunch of monitors, spent hours on colour calibration and adjustments. In the end, I was dissatisfied with all of the 5-star rated displays I bought after reading the great reviews on popular tech websites. And then I splurged on an EIZO CG276 and quickly understood that my search for the perfect screen was over. Having worked on it for several months, I then had to do something at my old workplace and I confirmed I had made the right choice. The difference is so phenomenal that even people who do not know the first thing about colour correction see it immediately. A good monitor for editing your content is about as important as good optics during photography – i.e. absolutely vital. Now I am constantly itching to go through all of my archives and re-edit everything with my new Eizo. For photo editing I use CaptureOne Pro – I think it is the best package for RAW conversion and initial colour correction. From C1 I export 16-bit TIFF files, which I then clean up and finish up in Photoshop, using a Wacom Intuos Pro M tablet. Nowadays, I can no longer imagine how to edit photos without a tablet. Among other instruments, I often use plugins such as Nik Viveza and Alien Skin Exposure. Oh yeah, a nice set of speakers and headphones is also critical, such as those made by Grado. Dry suit: Ursuit Softdura / Ursuit Heavy Light – Ursuit drysuits are great, robust and very comfortable. The Heavy Light is great for travel. Undergarment: Weezle Extreme plus – a very warm, soft and comfortable undergarment. BCD: TUSA Liberator Sigma II – a great compensator with a well-made weighting system and none of the unnecessary bells and whistles. Regulator: Aqualung Legend Glacia – never-ending no freeze regulators. We have about 6-8 of these and they are all in great working order. Fins: Scubapro Seawing Nova and Scubapro Jetfins – these are very important! Seawings are a great model, although they are an acquired taste. I use them for all my dives and take them along even when free equipment is available on site. They are light, powerful and manoeuvrable. The Jetfins are my second favourite model and I’ve dived in them for years. They are heavy, powerful and extremely robust. Mask: Scubapro Frameless / TUSA Visualator – both masks are a perfect fit for me and have a very wide field of view. Gloves and helmet: Zero. If you can find them – get several sets! Zero is a Japanese brand that makes wonderfully warm and soft gloves and helmets. I have never worn anything better on my hands or head. However, they are difficult to find and buy. Dive computer: Suunto Vyper – a simple computer which is sufficient for 99% of your dives. Now we're switching to Shearwater Perdix. Light: Light & Motion GoBe – a small and compact flashlight with a nice hand attachment system. And that is probably it. I am sure that this list will get longer and change with time, however as of now, this is what I work with and can vouch for.